If you’re familiar with synagogues, you know about yahrzeit plaques. Every congregation has them, and even before I posted them on this site, many of you emailed me to ask about them. While they were the most public reminder of our loved ones, they were not the only place where they and their relatives before them were remembered. In the archives I found three different yahrzeit books, at least two meant for public use, and from talking to members of the congregation I learned about another one that never turned up. I first heard about this book last fall from Allen Smooke, who grew up in Homestead and remains a member of the cemetery committee to this day. He said there had been a big, gold book that listed everyone who had passed away. It sounded strange to me, and at first I wondered what mix of lost objects and faded memories melded into his recollection of this fantastical tome. But then it turned up in the archives! Front cover of the gold yahrzeit book. Click to enlarge. 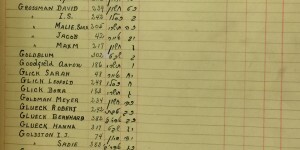 Dual-indexing system of the gold yahrzeit book. Click to enlarge. This book was created to remind congregants of their upcoming yahrzeits. 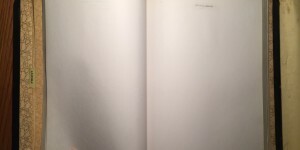 The photograph at right, showing the tabs that divide up the pages in the book, reveals how the book was used. 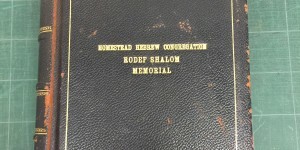 The front section, with names organized alphabetically, gives the month and day of the Hebrew death date and the page on which the person appears in the second section of the book, which has one page for each day of the Hebrew calendar and notes the deceased’s living relatives who are in the congregation. (Example pictures below). One can easily flip to a particular week or month’s pages to determine which relatives needed to come to shul to say kaddish. The “g” page from the front section of the book, listing where these people can be found in the second second. Note the entry for Ignatz Gross, third from the top. 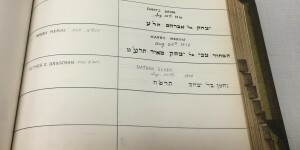 The page for the 15th of Elul, listing all of the individuals who died on that day (right column) and living relatives to contact (left column). 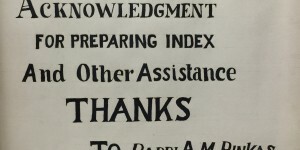 Note the entry for Ignatz Gross where the index said we’d find it. A Memorial book in which all names of those who have died since the Cemetery was established and buried at Cem. 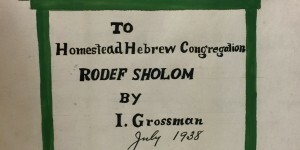 are inscribed prepared and arranged by I Grossman was presented to the Chewra Kadisha was accepted with thanks. Something about these passages tickles me — even as they’re repetitive, they grow more elaborate. You can just tell he’s unabashedly proud of this thing that he made. You can sense how he crafted it — how he envisioned this grand book in his mind and brainstormed how to create it with the materials and skills he had at his disposal and labored over all the details. I adore the resulting homespun quality — the awkward calligraphy and messy stitching especially delight me. Inside front cover of the gold yahrzeit book. Inside back cover of the gold yahrzeit book. Back cover of the gold yahrzeit book. As the front, alphabetical section makes apparent, this book was not updated after its creator died in 1948. Grossman’s own yahrzeit isn’t even listed, meaning there wasn’t even a short-lived attempt to pick up where Grossman left off. It guts me that this book fell into disuse after only a decade. If it weren’t totally, horrendously unethical to tamper with archived materials, I’d go through and do the work myself, inscribing each entry in handwriting mimicking his, starting first with Ignatz Grossman, כג אלול — which happens to be today, the day I am writing this (9/7/2015)! 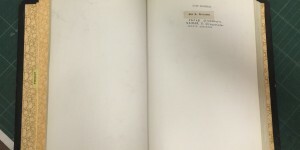 What’s strange about this book’s neglect is that Grossman made a copy of it in 1942, four years after the original, and the copy was kept up-to-date! Where the gold book is large and heavy, the copy is fairly compact and light. 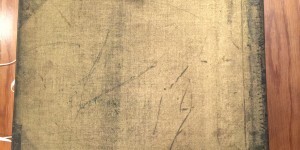 Where the gold book doesn’t show much wear (other than the heavily scuffed and faded cover), the copy is falling apart far more than any other congregational record in the archives. 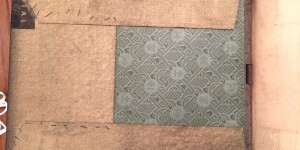 The title page had to be taped to the front cover, and most of the rest of the pages have long been detached from the binding. 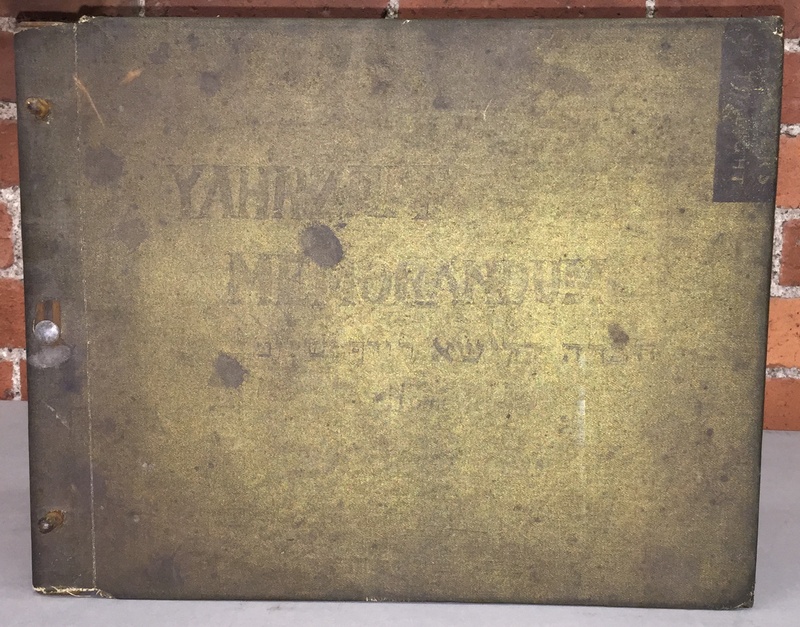 The plain cover of the copy of the gold yahrzeit book. 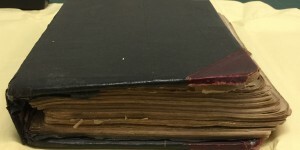 Note how none of the pages is attached to the binding anymore. 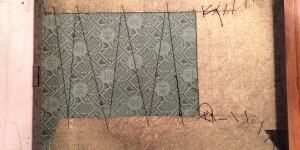 I can’t show you the title page any better than this photograph, because it was taped to the front cover of the book. As before it is atrributed to Ignatz Grossman — and also to Harry Seiavitch, shammes of the shul and cemetery, who likely took up the work after him! On the left you can see how the title page is taped to the cover, and on the right you can see how worn the front pages are. But here, on the page for the Gs, you can see many, many more names than the gold book, including Ignatz himself. And note how many different handwritings! The date pages are laid out as before. They, too, have far more entries than in the gold book. Otherwise the book is constructed identically to the first. 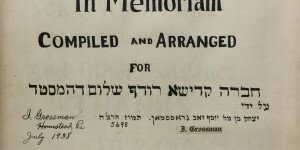 It even has the exact same title page text as the original — except for an additional name added below Ignatz’s: Harry Seiavitch, the shammes of the synagogue and cemetery. 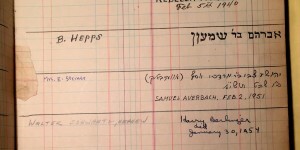 Though many different handwritings appear throughout the book, Harry must have played a large role in ensuring the congregation kept these important records up to do. In his first go-round Grossman fashioned a striking volume that conveyed the seriousness of the mitzvah to honor those who have gone before us. In his second, he fashioned something plain, but perhaps more functional. Was it simply that the first book was so cumbersome that he was asked to create a second one? Is that why the first one fell out of use? From what I can tell the book was updated into the 1970s. For context, Harry died in ’76, and the congregation ceased its formal operations in ’78 (though a small management committee continued work for another 15 years). As a result, this book is also missing many people, and so my hand also twitches to bring it up-to-date (though perhaps less than in the case of the Gold Book, since handling this extremely worn volume is anxiety-inducing). 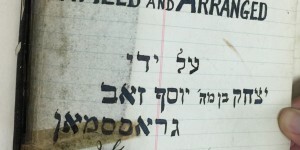 The very last meeting minutes that survive for the Chevra Kadisha relate that in February 1969, the “records of yartzeits (sic) and names on Memorial scroll being brought up to date.”7 This scroll is not a record which was preserved in the archives, but according to Allen Smooke, it really was an actual scroll! He said it was a long piece of parchment that was folded, not rolled. He recalled that Meyer Seiavitch would read it, and it would take a half-hour to an hour to get through all the names! So, in addition to the books and plaques, there really was a scroll, and they really did read all the names on it at least into the late 1960s! As much as I am sure I would not have enjoyed experiencing that tradition, it’s heart-warming from a distance to know that our loved ones were remembered so publicly for so many years after they passed. That said, what happened to this scroll?! Honestly, I have no idea what is going on with this book. 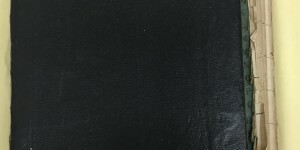 Unlike the others, it’s a fancy leather volume, professionally embossed. All of the pages have a name typed at the top. 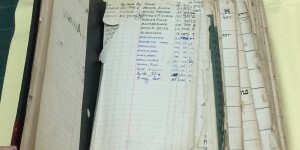 Some pages have additional names handwritten below. But there are no dates, no page numbers, no index, no nothing. Anyone got any ideas? The book is leather-bound with a gold-embossed title. All pages have a name typed at the top. 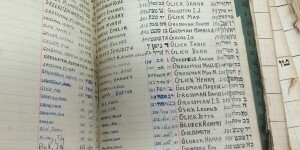 Some pages have additional names handwritten on them. For some reason they changed their mind about this page, which names my great-grandfather Bernhardt Hepps’ mother. This post covers December 15, 1935–February 13, 1967.